If you’ve ever paused to think how much water gets wasted when you flush the toilet or wash your hands, you’ve joined one of the millions of people concerned about dwindling freshwater availability. It’s true—the world is running out of good water, and wasting what we have. Global demand for water will only increase while leaks, inefficient appliances, and more are flushing millions of gallons away every year. Yikes. Fortunately, smart people are working on the problem, and just by noticing it, you’re one of them. The EPA has offered one solution in the form of WaterSense, a voluntary program that labels a consumer product that was designed to be water efficient. To earn the label, a product must show it uses at least 20% less water or energy compared to peer products. These water-efficient products offer big savings on monthly bills, with the small bonus of saving the planet—one drop at a time. The future of water conservation is in the WaterSense program. It’s easy to forget the world’s water is running dry. Each American uses an average of 88 gallons of water a day, with half of it being flushed or drained away in the bathroom. That waste is a contributing factor to coming problems in forty states, where water managers are planning for severe shortages nationwide in the near future. Reducing use and guaranteeing efficiency is essential to preserve this vital resource. WaterSense is a great step toward meeting that goal. WaterSense establishes partnerships with all types of industries, from manufacturers, retailers, distributors, home builders, and irrigation experts, in communities. 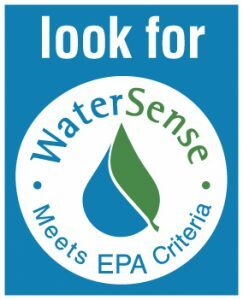 The WaterSense label is given only to bathroom appliances that meet independently certified and rigorous performance evaluations that ensure efficiency. For example, when technological advances in toilets have allowed 1.28 gallons per flush­­—down from the old standard 1.6—without affecting performance in any way, there’s no reason manufacturers shouldn’t be pushing for a WaterSense label. When the showerhead, toilet, and faucet aerator all have WaterSense approval, real water conservation is possible, and water shortages can be prevented. Now, let’s talk brass tacks: dollars and cents, that is. A home’s primary bathroom equipped with a toilet bearing a WaterSense label can pay for itself within a year. One year! The savings on bills makes conserving water a profitable mission for homeowners. Products bearing the WaterSense label are investments, rapidly earning back their upfront cost and saving hundreds or even thousands of dollars in the years following installation. There are many companies developing appliance technology that not only saves water but makes bathrooms cleaner, easier to use, and quieter. To prevent losing the average 13,000 gallons of water per year to inefficient and leaky toilets, invest in saving yourself money. While you’re at it, help ease the strain on the world’s natural resources. When developing or purchasing bathroom appliances of any kind, look for WaterSense. It’s just plain smart. Visit here for more information about WaterSense and its important mission.